Chhaang, chang or sometimes reffered to as Himalayan Beer is an intriguing drink, to say the least. 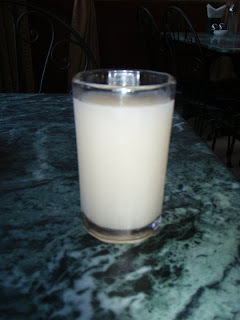 A milky white drink with flecks of floating white chunks throughout. Sometimes referred to as Nepali beer, chang is a fermented rice beverage, making it similar in appearance, taste and production method to unfiltered varieties of Japanese sake. The taste is sweet at first like a fruit wine but quickly becomes quite tarte. The method of consumtion varies throughout Himalayan cutures. Served cold it can be quite refreshing in the humidity of Kathmandu although when warmed it may assist one to brave the alpine chills. According to legends, chhaang is also popular with the Yeti, who often raid isolated mountain villages to drink it. So if you find yourself in the Himalayas looking to get 'Yeti drunk' try a Chhaang for change.